Cinnamon Roll Apple Rose Tart is a beautiful dessert to wow your guests at parties and holiday celebrations. It’s a delicious combination of fresh apples and cinnamon rolls with only 5 ingredients. Plus video tutorial! 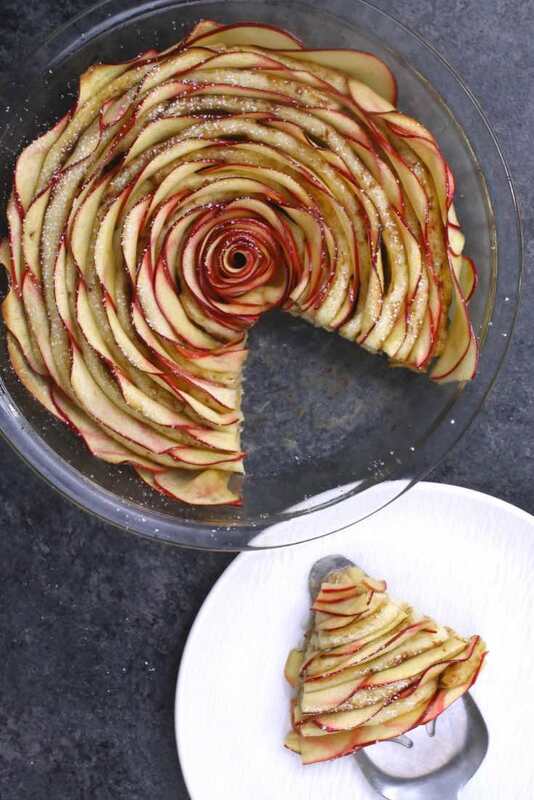 This mesmerizing Cinnamon Roll Apple Rose Tart is absolutely one of my favorite desserts. 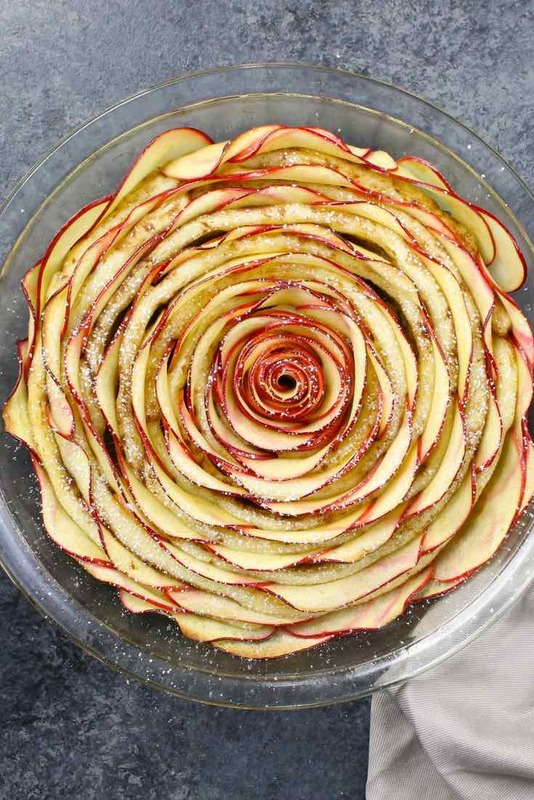 You won’t believe how beautiful the apple roses look and how amazing they taste. 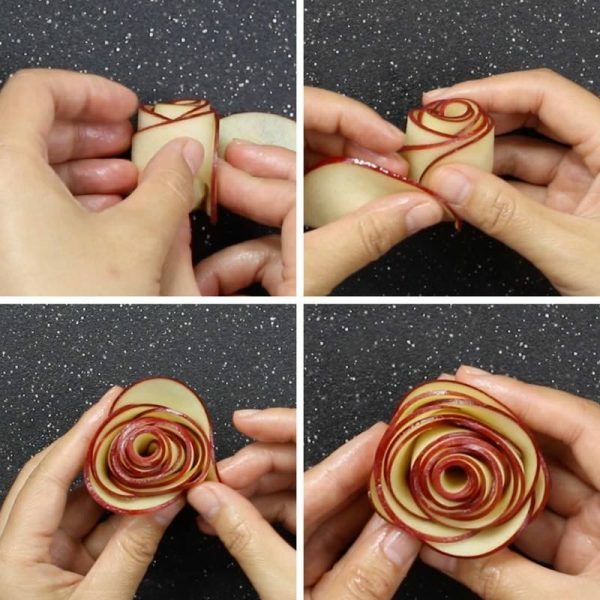 All you need is only a few ingredients — cinnamon roll dough, red apples, lemon juice, brown sugar and butter — along with about 20-30 minutes of preparation time to make this gorgeous rose apple. 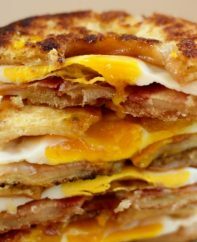 This recipe is definitely a crowd pleaser for holidays like Thanksgiving or Christmas, and people love it year round. It’s also easy on the waistline. While it can look complicated at first, a few hacks make this recipe doable by anyone. It’s more work than brownies, but much easier than making an apple pie. Before you start cooking, try to pick the best apple possible. I have tested many apples and my fave for this recipe are medium-large size Red Delicious apples, available year-round in most supermarkets. It lends a bright red color to the apple rose, and is study enough to hold its shape. There are other more flavorful varieties like Honeycrisp or Fuji, but the color often pales after cooking. Since making apple roses means making thin slices of apple, there are a few hacks to prevent them from browning during preparation. Traditionally fresh lemon juice is squeezed onto the slices, sometimes with water as well. While this approach is easy enough and works just fine, it can impact a sour taste to the apples. Our preferred approach is to use lemon juice combined with brown sugar and melted butter. Adding this mixture prevents browning and adds flavor. After coring, the apples should be sliced to about 1/8″ thickness. A mandolin can be helpful for this task, but failing that a sharp paring knife will do the job just fine. Once you’ve coated the apple slices with the brown sugar mixture, they need to go into the microwave for 2 minutes to become pliable. Alternatively you can put them in a pot over low heat for 5 minutes to achieve a similar effect. You can layer on more slices around the outside if you want to create a bigger rose. In this recipe, the bigger the rose, the more beautiful the dessert. Once you’ve made the rose, it should hold itself together. If you’ve arranged the cinnamon roll in the pan already, then you can insert the rose into the middle. This is it – the final assembly before baking! Grab a 9-10 inch pie plate or cake pan along with a package of refrigerated cinnamon roll dough. 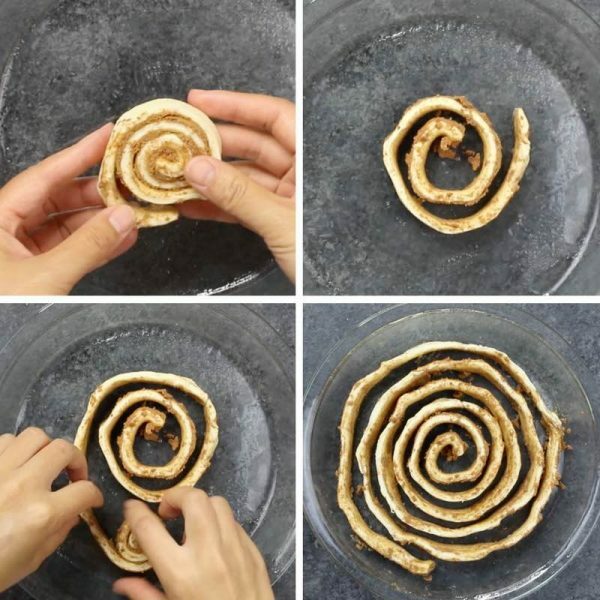 It’s basically a process of unravelling a few cinnamon rolls in a spiral pattern in a pie plate. 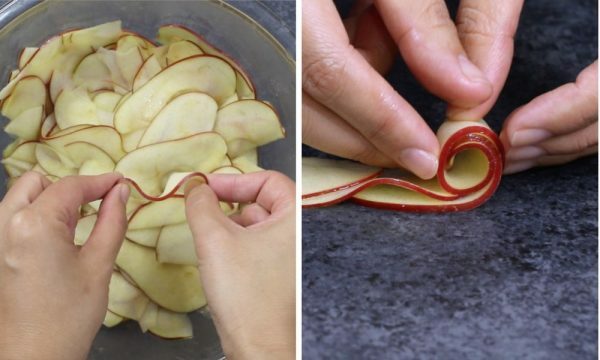 Once you have a spiral, simply insert apple slices in between and pull the dough slightly to tighten it up. It may look challenging, but it’s actually pretty straightforward. And don’t worry about any imperfections because the dough puffs up during baking fills any gaps or wobbles. 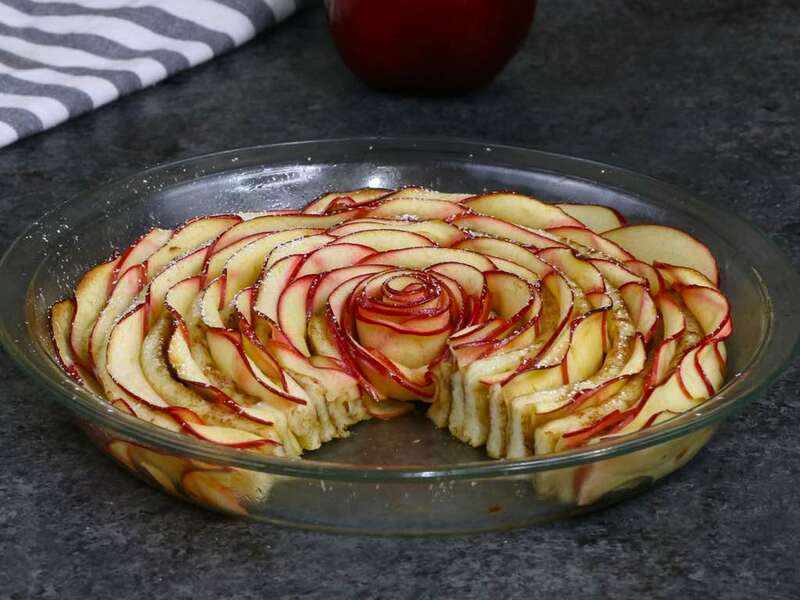 Wow your guests with this gorgeous and delicious Cinnamon Roll Apple Rose Tart. 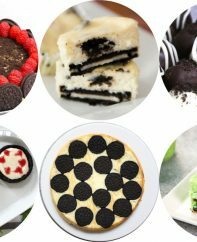 It’s so easy to make and perfect for any party. Preheat oven to 375 F. Spray a 9-inch round baking dish with nonstick cooking spray and set aside. Open the can of cinnamon rolls. Unwind several rolls and arrange into a large spiral to fill up the dish, following the video. Halve each apple lengthwise. Remove the core and seeds. Using a sharp paring knife, slice the apple halves lengthwise to 1/8-inch thick pieces. 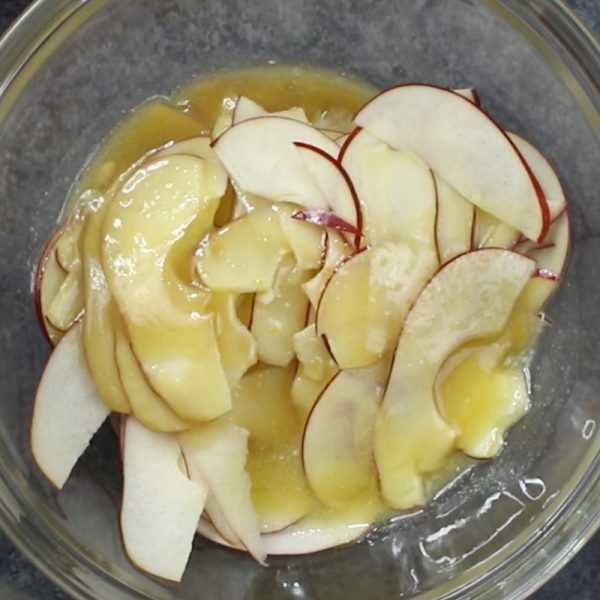 In a large bowl, add apple slices and lemon juice, mixing well. In a small bowl, mix brown sugar and melted butter together. Then add to the apple slices, stirring to coat. Microwave for about 2 minutes or until the apple slices are pliable. Strain out any accumulated liquid. 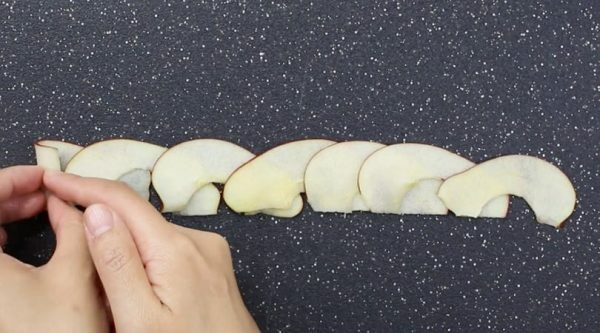 Arrange about 8 apple slices in a straight row with an inch of overlap on each. Starting with one end, gently roll the slices together to make a rose. Place rose in the middle of the cinnamon dough spiral. Insert apple slices to fill the gaps between the cinnamon rolls in the spiral. When the dish is full, bake for 20-25 minutes until the dough is browning. Remove from oven and dust with powered sugar. Serve and enjoy! Looking for more apple rose recipes? 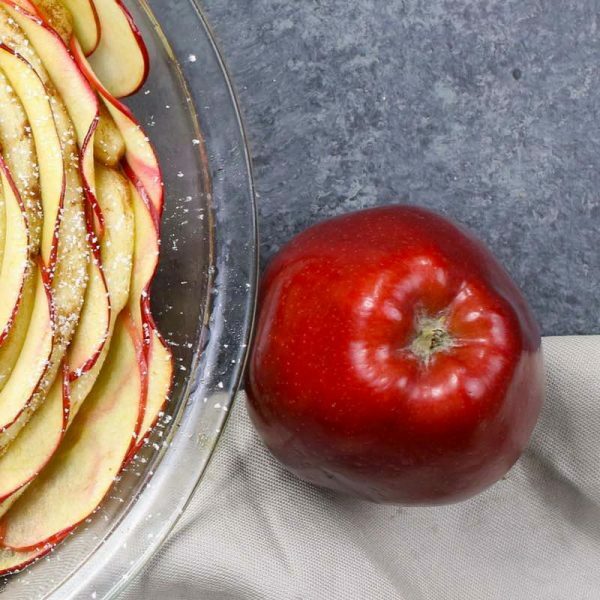 Looking for more apple desserts? 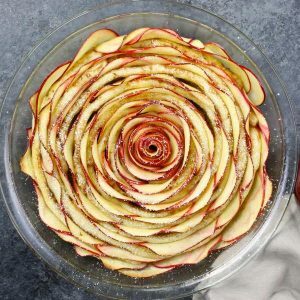 The final presentation in the shape of a beautiful rose using apples is so amazing. A dessert that can be proudly served at any dinner party. I am wondering to keep this in the fridge or on the counter? I just made it and itll be served about 9 hours from now. Can anyone recommend a brand of gluten free cinnamon rolls which are relatively easy to find which can be used in this recipe? I feel bad making deserts that my wife can’t enjoy with the rest of us. Total failure. I consider myself a good baker but the rolls would not unroll and that was the biggest issue. Now I read that the brand I bought doesnt unroll. I would think that if the nation’s most popular brand doesn’t work that important information would be included in the directions. So glad I didn’t make it for company. Hi Connie, Thanks for your review. I know it’s so frustrating that the brand reformulated the product so they won’t unroll, but you can find the correct ones for that brand at Sam’s Club and other brands still unroll. I’m planning on making this for Thanksgiving, can I make it a day ahead of time or should I plan on that day. Should you leave it out for the night or put it in the fridge? Hi Kristin, Either is fine, but cover it with plastic wrap. MY apples don’t roll and are a bit soggy I guess you can say what should I do? Hi Ashley, No problem – just pat them dry with paper towels… Hope that helps! Wish I would have read the comments first. Same problem, bought pillsbury and too thick. 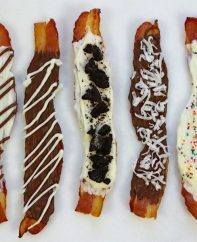 You should update the recipe and mention buying STORE brand in ingredients or change directions to having to hand roll out the strips. Just family here on Thanksgiving but what a disappointment. Hi Lyn, Thanks for your review and sorry to hear. The info about the cinnamon rolls was in the post, but will add to the recipe too to be more explicit. I used Pillsbury, cutting spirals in the dough worked just fine. It was very yummy. Thank you for the recipe. We enjoyed it. Hi Kelsey, Thanks for your comment and glad it worked out 🙂 ! Hi! Can I use granny Smith apples? Great idea for a holiday just wondering if i make it a day ahead would the apple get soggy how do i store it?? Hi Damaris, Thanks for your review. You can definitely make it a day ahead and store covered it in plastic wrap. It won’t get soggy, but I would recommend reheating is gently for 5-10 minutes nonetheless. Enjoy! 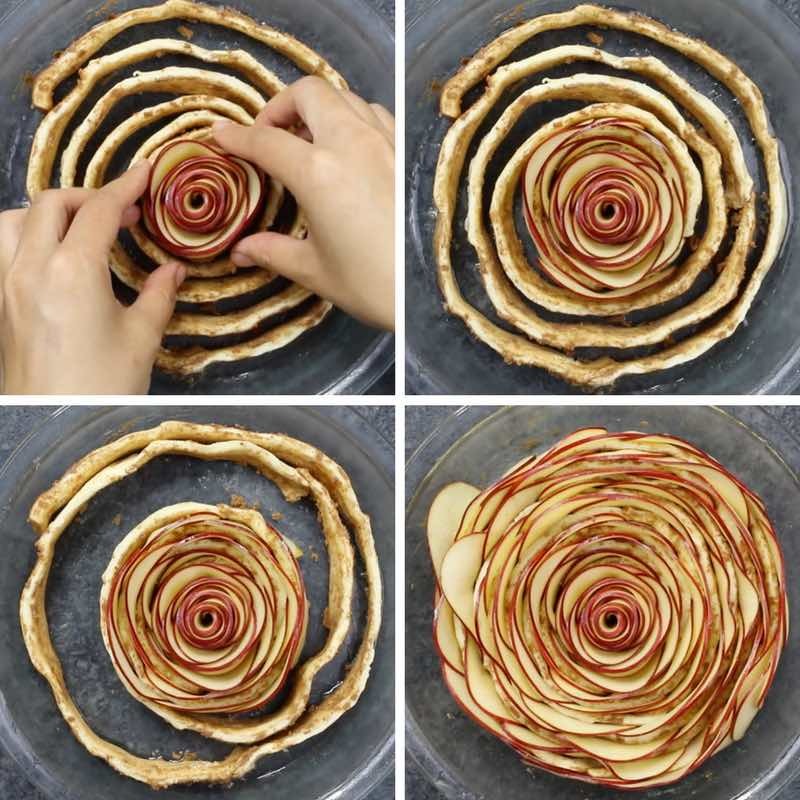 This Cinnamon Roll Apple Rose Tart looks SO deliciously good. I wish I could eat that right now!